The FTSE 100 largest groups registered on the London Stock Exchange comprise 34,216 subsidiary companies, joint ventures and associates. 38% (8,492) of their overseas companies are located in tax havens. 98 groups declared tax haven companies, with only two groups, Fresnillo and Hargreaves Landsdown, who did not. The banking sector makes heaviest use of tax havens, with a total of 1,649 tax haven companies between the ‘big four’ banks. 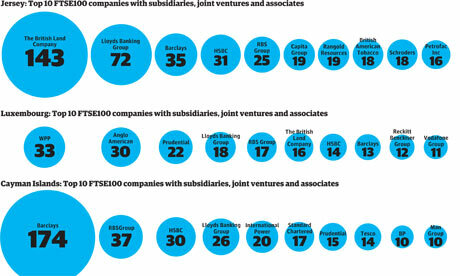 They are by far the biggest users of the Cayman Islands, where Barclays alone has 174 companies. The biggest tax haven user overall is the advertising company WPP, which has 611 tax haven companies. The FTSE 100 companies make much more use of tax havens than their American equivalents. There are over 600 FTSE 100 subsidiary companies in Jersey (more than in the whole of China), 400 in the Cayman Islands and 300 in Luxembourg – all tiny tax havens. "BP and Shell have almost 1,000 tax haven companies between them, including more than 100 in the Caribbean (hardly a major source of oil)." "In locations such as Mauritius, Jersey and Delaware we have identified hundreds of subsidiaries owned by dozens of different multinationals that are registered at a handful of individual addresses, belonging to offshore law firms." Corporate tax avoidance, one of the main reasons companies use tax havens, has a massive impact on developing and developed countries alike. The lack of transparency makes it difficult for developing country tax authorities to identify and collect taxes owed by global companies operating in their countries. This research is based on information that had never been disclosed, let alone analysed, until this year.11 UK law compels companies to report all of their subsidiary companies, together with their country of registration. When we looked for this information in early 2011, we discovered that more than half of the FTSE 100 were not complying with this legal obligation. When enquiries to individual companies failed to persuade them to disclose the information, we submitted complaints to Companies House, forcing the disclosures as part of companies’ annual returns and sparking Business minister Vince Cable to announce an investigation. "There is no standard definition of what constitutes a tax haven." Indeed. We use the terms 'tax haven' and 'secrecy jurisdiction' interchangeably, and recently produced a two-pager (as part of our Financial Secrecy Index) entitled What is a Secrecy Jurisdiction? which says exactly that, and explores ways to think about the phenomenon. Take a look, too, at ActionAid's useful Tax Haven Tracker. Also see The Independent reporting on this, along with the Press Association, and Metro. Older reports, involving the use of companies in tax havens by Swiss, US, France, and the Netherlands, are here. Further information on Spain, is here.